Visitors to Colorado's Rocky Mountain National Park who are looking for a good option for camping just outside of the park will find Olive Ridge Campground a great fit. Campers will be just a 10-minute drive from the ranger station at Wild Basin, the gateway to the stunning Bluebird Lake Trail and Thunderbird Lake Trail, among others. The Longs Peak Trailhead is also 10 minutes away and a little farther north on Highway 7. Additionally, the small community of Allenspark is just south for easy restaurant options. This is also where you'll find nearby San Malo Church, located just north of the campground, otherwise known as the Chapel on the Rock. Built in 1936, the church has recently endured some travails including a very damaging fire in 2011 that closed the building, but the building's dramatic profile and location along Cabin Creek still make it a worthy stop. 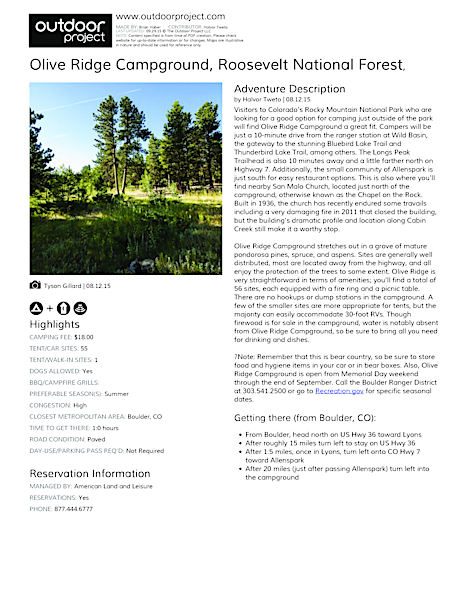 Olive Ridge Campground stretches out in a grove of mature pondorosa pines, spruce, and aspens. Sites are generally well distributed, most are located away from the highway, and all enjoy the protection of the trees to some extent. Olive Ridge is very straightforward in terms of amenities; you'll find a total of 56 sites, each equipped with a fire ring and a picnic table. There are no hookups or dump stations in the campground. A few of the smaller sites are more appropriate for tents, but the majority can easily accommodate 30-foot RVs. Though firewood is for sale in the campground, water is notably absent from Olive Ridge Campground, so be sure to bring all you need for drinking and dishes. ​Note: Remember that this is bear country, so be sure to store food and hygiene items in your car or in bear boxes. Also, Olive Ridge Campground is open from Memorial Day weekend through the end of September. 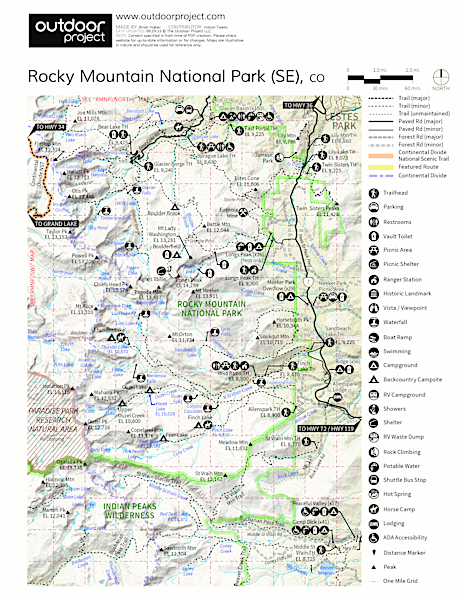 Call the Boulder Ranger District at 303.541.2500 or go to Recreation.gov for specific seasonal dates. Set in a beautiful ponderosa grove. Large campsites. No views. No water. Few amenities. We stayed at Olive Ridge and enjoyed it quite a bit. While the sites are decently long, they tend to be narrow, making backing a trailer very challenging. RV campers should be very careful of the loop road, which is quite narrow and has numerous trees and rock obstacles. While the campground doesn't have water, there is a spring on the side of the road in Allenspark (about 3 miles away) which has wonderful water that the locals frequently use for drinking water. GPS coordinates: 40.193039, -105.524008.